Eidos Montreal are no strangers to taking control of some of gaming’s biggest legends. After having impressed the world with their deft treatment of Deus Ex, the studio stumbled with Thief, but they’re looking to regain their footing with one of the medium’s most iconic characters: Lara Croft. Eidos Montreal are taking over from Crystal Dynamics for this year’s Shadow of the Tomb Raider. As such, they’re looking to put their own signature on Lara’s Mayan adventure. Shadow of the Tomb Raider is the third and final game in Lara’s journey to becoming the kind of archaeologist superhero that the original Core Design games portrayed her as. The 2013 reboot showed her as a teenage graduate forced to become a survivor, while the sequel saw her developing the skills, knowledge, and enthusiasm required to be the Tomb Raider. 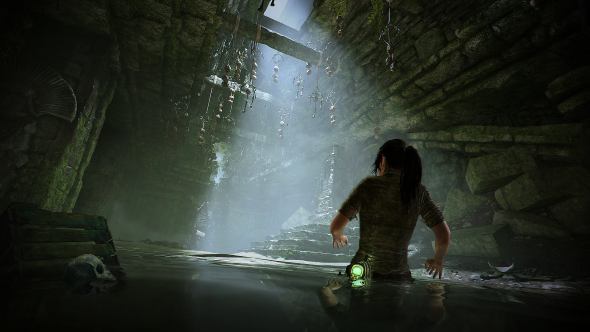 Now, for the final chapter of her development, Lara must face her fears. Rise of the Tomb Raider features a small collection of fascinating, memorable tombs, but Shadow will portray these challenges in a new light. Rather than being astonishing, beautiful relics from the Byzantine era, these Mayan constructs are all about fear and sacrifice. Immersion is, of course, something of an Eidos Montreal speciality. Having spent the best part of the last decade working on immersive sims, the studio has come to understand the strengths of deep, free-form gameplay. It’s something they hope to double down on with Shadow of the Tomb Raider. 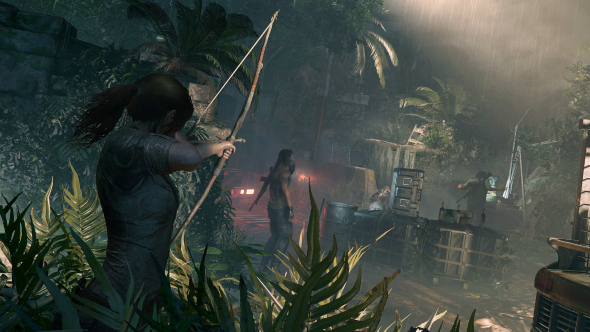 The jungle environment looks to be essential in creating a take on Lara’s adventures that is in the Eidos Montreal style. Like the near-future of Deus Ex, the environment is dense and filled with details to observe and utilise. Vents and offices may be replaced with vines and trees, but they’re no less exploitable. Making use of the jungle and what you find within it will be key to the experience. When pressed for further details Anfossi refuses to break, teasing that E3 will reveal more of Eidos Montreal’s tweaks to the series’ formula. Should you be a fan of Crystal Dynamics’ work on the series there’s little to worry about, as Anfossi promises that they are being “respectful to the franchise,” and that their main focus is on striking the right balance of platforming, combat, and raiding tombs. During the hour of Shadow of the Tomb Raider I played at the game’s reveal event, Lara’s personal journey was what impressed me the most. Her desperation to outpace the evil Trinity organisation has made her hasty and single-minded, causing fallout among her friends. Taking Lara to the brink of being almost unlikeable is a bold move, but one I have faith will deliver an interesting tale of self-repair. And when you consider Eidos Montreal’s strengths with Adam Jensen in Deus Ex, it would appear Lara’s story is in very good hands. It’s easy to wish that Crystal Dynamics had finished up the Tomb Raider trilogy themselves – the 2013 reboot focused on the personal struggles of Lara more than any other game in the series prior, and it feels strange for this chapter of her story to be concluded by a different studio. But the change in hands allows Crystal Dynamics to bring their indisputable talents to The Avengers, finally providing Marvel with the opportunity to have a respectable triple-A hit. Rather than being replaced with a B-team, Shadow of the Tomb Raider gets to be helmed by a studio who not only have been quietly supporting Crystal Dynamics since the the start of the survivor series, but who really know their way around a blockbuster videogame. The first demonstration of Shadow of the Tomb Raider only hinted at the Eidos Montreal signature, but I hope that the studio’s past work becomes more evident as we see more of Lara’s formative chapter.